Do you have the guts to go hunting on horseback? The hunt field is an experience rich with tradition, but in order to keep up with most hunts, you need to be a skilled rider on a talented, safe horse. Hunts are fast-paced, exciting, and exhilarating, especially if you love jumping over anything in sight. This video gives you a great sense of just what it's like to take part in a hunt without having to actually mount up. 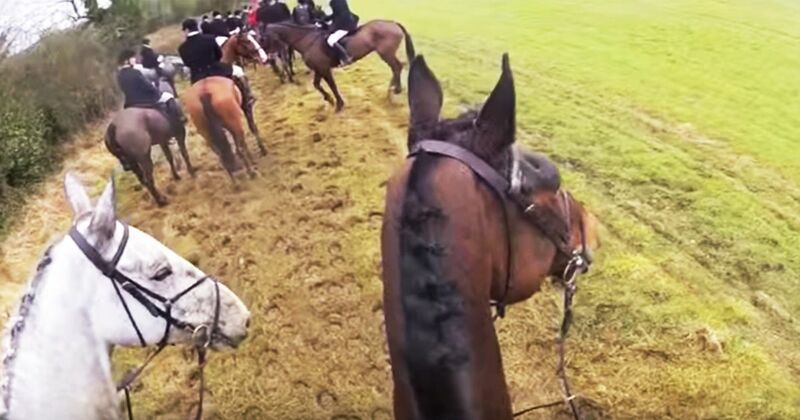 A video camera mounted to a rider's camera shows just how fast obstacles come up on a hunt, and gives you a sense of how quickly the horses move. Jumping solid fences in close-quarters is a common occurrence when you're hunting, but these riders seem to be absolutely fearless. If you would like to give hunting a try, you'll need to do some preparation, according to Horse and Hound. First, make sure that your horse is suitable for hunting. Your horse needs to be fit enough to canter and gallop over long distances, and he should be a confident jumper. A horse who is surefooted and careful will also help to keep you safe in the hunt field. Next, look for a suitable hunt. Contact your local hunt club to find out about upcoming hunts, and speak with the secretary to find a hunt that is suitable for you and your horse. Be sure to get details about parking and how much you will need to pay to participate in the hunt. You'll also need to consider the dress code. Riders who participate in a hunt dress similarly to show attire; it's a show of respect to get both yourself and your horse cleaned up. Clean boots, breeches, a shirt and stock tie, a dark colored jacket, a helmet, and gloves are a must. Always opt for reserved colors and make sure that you're wearing a hair net, too. Your horse should also be clean and presentable. In some cases, you will want to braid your horse for a hunt, but it often depends on the time of year when the hunt takes place. A clean saddle pad and clean tack are a must, and groom your horse until he's shining. Have a great time, and don't forget to grab mane!